The 8th Annual Susan Polgar Girl’s Invitational will be held this year July 24-29 at Texas Tech University (TTU) in Lubbock, Texas. This is one of the most prestigious all-girls events and will incorporate a three-day intense training with Susan Polgar and her team of chess instructors, followed by a 6 round (g/60) championship tournament. There will also be Blitz, Puzzle-Solving and Bughouse events and over $120,000 in chess scholarships and prizes (including netbook computers) will be awarded. Each state is allowed to send one representative. Alternates may be substituted if named by June 15, 2011. Our hope is to have all 50 states and the District of Columbia represented. If the state affiliate does not recommend a representative, the Susan Polgar Committee may determine the candidate from that state. Players must have been enrolled in a school (through 12th grade) from the state they represent. Additionally, home-schooled students who have not yet enrolled in college courses prior to June 1, 2011 are also eligible to represent their home state. 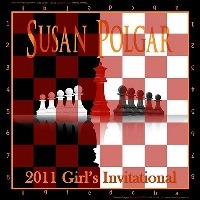 See http://polgargirls.blogspot.com/2011/02/8th-annual-susan-polgar-girls.html for more SPGI details. Please send the name and email contact information for your state’s nomination to PolgarCommittee@gmail.com no later than May 15, 2011. Should you have any questions, do not hesitate to contact Martha Underwood, PhD, 2011 SPGI Chairperson, or one of the other committee members at this email address.